Join the Battle in Making our World a Greener Place! This is where we live; a small step to save the earth is in our hands, so let us do one small thing today. At St Theresa, our ambition is to achieve the highest waste reduction, recycling, and reuse goals within the campus through innovation and creativity, and efficient programs that improves school social vitality and environmental sustainability. We invite you to be a part of our efforts to promote environmental health and safety by restoring waste materials, re-using waste products and conducting awareness through health education in order to protect and enhance the environment all year round. Put your creative skills to the ultimate test by joining our competition on 8th August 2016 & 10th August 2016, where you can showcase your creative ideas for converting everyday trash into useful items. Prizes shall be awarded to those who produce the most innovative / creative works. To create an art exhibit using recyclable materials. To provide awareness to the students about the benefits of reducing, reusing and recycling. 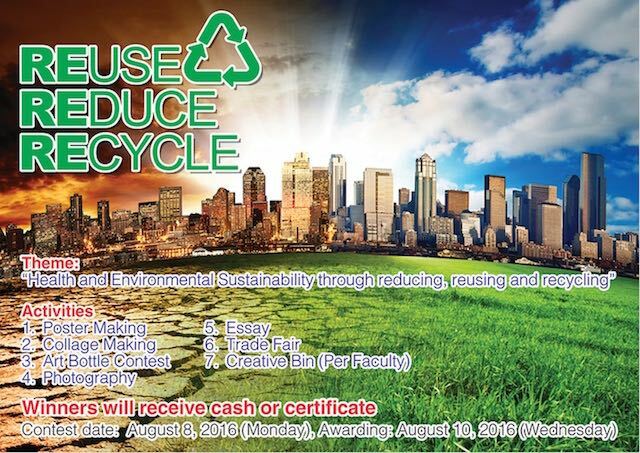 To encourage proper waste disposal all year round by collecting reusable materials per Faculty. For more details on how you can participate, please visit the student affairs office now.